Congrats! Your massive walk-in pantry is stocked to the gills and you’re officially ready to take on the next Snowmaggedon/power outage/transit strike. But if you can’t find what you’re looking for, all your prep is for naught. Here’s a better way to organize, so you’re always two seconds away from locating those canned garbanzo beans. Step 1: Invest in wicker or metal baskets that tuck nicely into your pantry. Step 2: Separate all your pantry items into eight categories, or “zones”: baking supplies, breakfast supplies, kids’ food, beverages, paper goods, spices, instant meals (hey, ramen) and general canned goods and kitchen staples (like chicken stock and tomato paste). 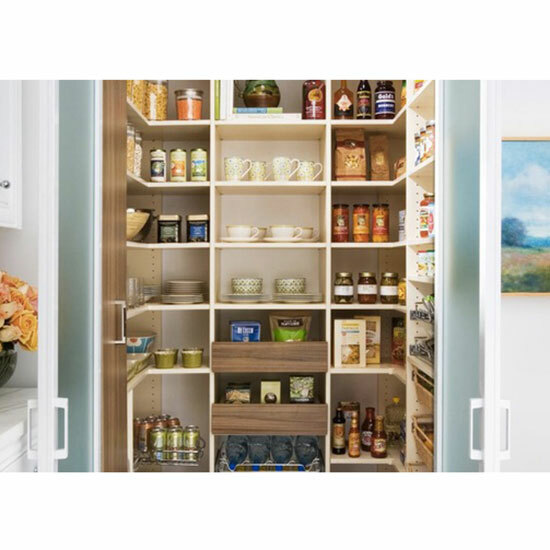 Step 3: Put the baskets in your pantry, designating a different area for each of your zones. You can even label them, if so obsessive inclined. Place your pantry items in their corresponding basket, and go about your life. Step 4: Rejoice! The garbanzo beans are right there in “kitchen staples” the next time you need them.